Pamela’s background is in administration of grant funded projects in research and local government. Prior to the IRI, she worked in community development, supporting local governments through development and adminstration of infrastructure and community grants. 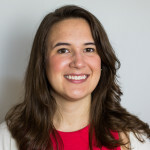 She holds a BS in psychology from Furman University and an MPA with a concentration in economic development from the University of Kentucky Martin School of Public Policy and Administration. Pamela serves as a project coordinator on several projects. In this role, she supports the administration of full project cycles, including work plan and proposal development, budget tracking, and progress reporting.